New beginners can now join our Saturday 3:30p beginners classes at several "introductory" classes through the year. Dates are announced by email. Enrol below if you'd like to be notified. Special 4 weeks course, just for new beginners! Saturdays from Jun 23 - Jul 14 @ 3:30 - 5pm. 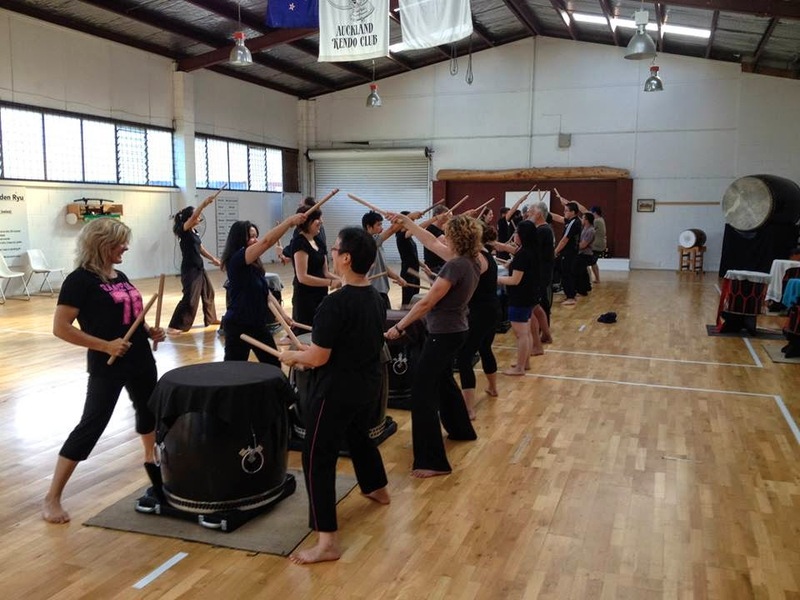 Tamashii teaches a full range of taiko courses at 4 different ability levels. Our teaching team will introduce you to the songs, traditions and training style of Japanese taiko drumming, as well as teach you teamwork and performing skills if you'd like to progress towards performer-level. It's a fantastic, life-changing experience and a great community of people. Click to enrol in our upcoming courses now. New students join our Beginner level class on special Intro Saturdays that we'll announce by email. We'll organise those special Intro classes every 1 to 2 months, depending on our class & events schedule. If your're interested in joining, enrol now. We'll save a space for you, and notify you as soon as we have class dates scheduled. Enroling does not commit you to anything. Hang tight, you'll get an email within the next month, announcing the next Intro class date. These will always run Saturdays at 3:30p-5p in Panmure. Join it if you can, as a casual class ( $20 ). If you can't make that date, another will be scheduled in 1 to 2 months. If you join the class and want to continue, you can join the term, and continue with the team in that same class time slot. Terms run 10 weeks, and fees are $120/adult, $90/student. Introduction to Taiko is a special course for new beginners. How do class terms work? Tamashii runs four ( 4 ) terms a year, each one typically running 10-weeks in length. Casual classes are $20 per, and term fees cost $120/adult, or $90/student. When you join your first term, each new student will also receive your own pair of bachi ( taiko drum sticks ), and our online taiko handbook, so that you can practice your taiko skills at home. We have 4 levels of classes so each year, the teachers will gradually progress students into more advanced classes, once they can no longer grow further with the current level class. There are no breaks between terms except for the Christmas holiday break ( when we run casual classes ). Our classes are designed for Adults and Students (Year 9+), but we welcome school-age children (Year 1 - Year 8) who join the class with a parent or older sibling. Taiko is suitable for any age or fitness level! We encourage a high level of energy in your playing, but our rule is only put in as much as you are comfortable with. We have students of all ages, from 10 - 85. All of our regular classes run in Auckland, at our dojo in Panmure. If you live outside of Auckland, contact us - we offer special workshops for out-of-town visitors, and we may be able to connect you with a team nearer you. If you are unfamiliar with taiko drumming, be aware that it involves lots of movement. Wear comfortable clothing that is suitable for good exercise, and bring water and your favorite snacks as well to keep you energized. In cold weather, a thermos of hot tea or coffee and layered clothing are usually best. You may start the class cold, but you will be very warm after the first half-hour! Our regular class is not designed for children, however we can usually accommodate children 6 years and over if a parent participates in the class with them. From high-school age onwards, no parental involvement is necessary. For large groups of children, Tamashii can do school performances and workshops, as well as holiday programmes. Contact us to learn more. Our teachers can offer one-on-one lessons or small group sessions, for any student level. For large groups, we also offer private workshops. Tamashii is a performing team, with usually 60+ gigs per year. Our goal is to share our passion with the world, and to grow our team as much as possible. We're also working to expand our instrument base to include Japanese flute, shamisen, and koto. If you have performing experience or you think that you would like to reach performing level in our taiko classes, let us know! We do not require you to perform, but we encourage every class member to develop performing skills and the performers mindset. If you already know that you would like to perform with us, we can adapt the class curriculum, and give you at-home practice exercises to help you achieve that goal personally. Every 1 to 2 months, run on specially announced Saturdays! Cost - $20 for a casual class.